Bing and Yahoo! search engines provide advertising service called Bing Ads. The advertising program is based on pay per click advertising and it works in a similar way as Google AdWords program does. Maximum bid is determined by the advertiser and it is the best way to monitor and limits your costs. Click through rate also has an important role when determining how often the ad will be displayed, as the goal is to provide relevant and useful ads. Relevance of the ad – Bing analyses how your ad is related to the specific search query. Bid – Your bid determines the position of the ad, as it is compared to the other advertisers who are bidding for the same keyword. Performance of the ads in the past – If you have managed successful online campaigns with your Bing account it the past, which had high CTR, it is more likely that this will have a positive influence on ranking your ads in the future. While you will find a lot of similar features and options with Google AdWords, Bing Ads have one feature in particular that allows you to target ads by restricting the ads to specific demographics, while in the same time you can increase the bids when the ad is seen by a user of a certain demographics. Start by visiting the home page of Bing Ads: http://advertise.bingads.microsoft.com/. When you start creating an account for Bing Ads, you will have to use a Microsoft account to do so. You can either use an existing account or create a new one. After you have signed in with the Microsoft account, which will be associated with your Bing Ads account, you will have to provide some additional information, such as company name, currency, etc. In the next step, you can choose to import a campaign from Google AdWords, to create a new campaign, or skip both of these and go directly to your account. 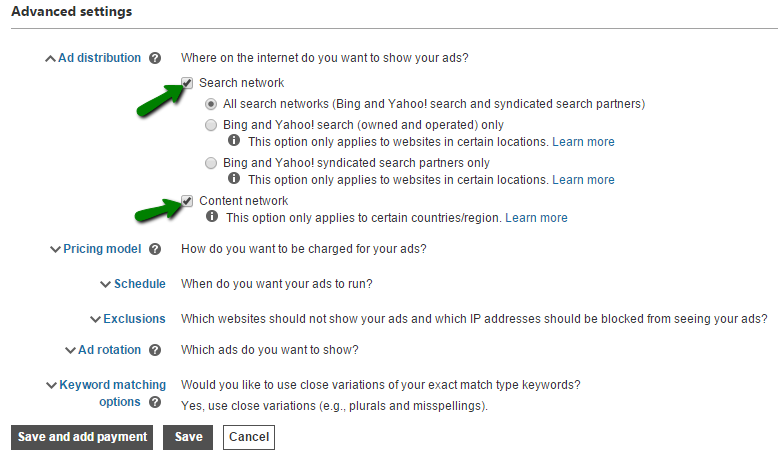 You will notice that the main features of the Bing Ads account resemble the ones available in Google AdWords. The tabs at the top of the page help you navigate across different tabs and options. Home – The first tab shows campaign trends and alerts related to your account. You will also be able to see the basic performance data for the campaign. Campaign – If you want to get more in-depth data about your campaign, as well as to get access to all of your campaigns, you should use this tab. The data are shown for the campaigns, ad groups, ads and keywords, enabling you to monitor quality score, budget, clicks, impressions, CTR, etc. 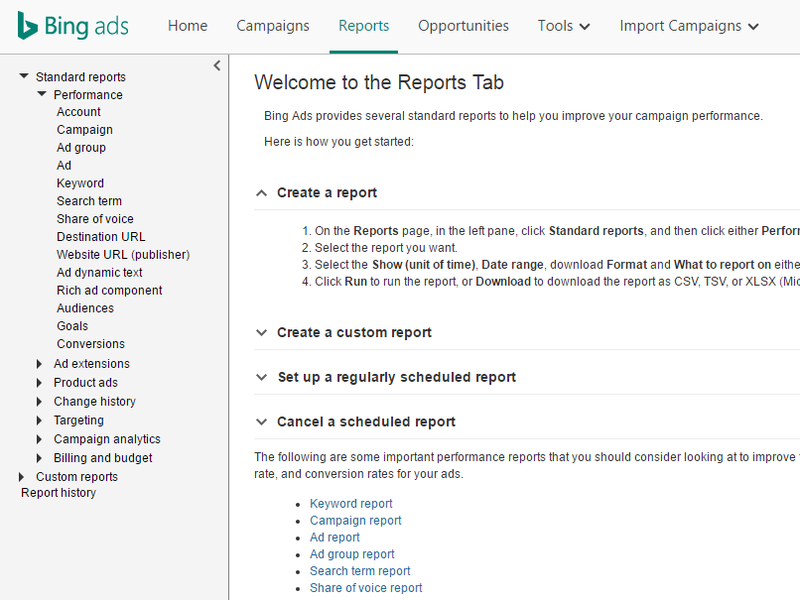 Reports – This option enables you to create a custom report of your campaign. You can choose the type of report, date range, format, etc. The report can be completely customized, as you can choose only those columns and data you want to see in the report in order to analyze the performance of your campaign. Besides campaign report, you can also download different types of reports, such as a report focused on ads performance, keywords, product target, destination URL, etc. Opportunities – The following tab shows you opportunities to improve the performance of your campaigns and optimize your account in order to benefit from advertising with Bing Ads. Tools – There are several tools that you can use to help you with campaign and ad optimization, as well as with monitoring and tracking. Some of the tools include: Ad Preview and Diagnostic Tool, Keyword Planner, Bing Merchant Center, Bing Ads Editor, etc. Import Campaign – The final tab represents a shortcut allowing you to quickly import campaigns from Google AdWords or from a file. 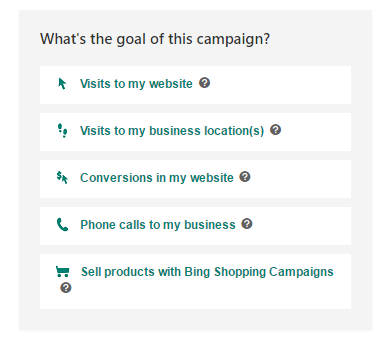 There are three types of campaign that can be created with Bing Ads. Start by creating a campaign. Go to the tab Campaigns and find the button “Create campaign”. You will than choose a goal, before you proceed to other campaign settings necessary to complete the process. You should first choose the campaign settings, including the campaign name, budget, as well as the location targeting options. As you provide information about the ad, you will see a preview on the right, including the preview of the side ads and mainline ads. Finally, you will have to provide the list of keywords. You can either type or paste the keyword list, if you have one that you have already used in the past, or you can use Research keywords button to explore keywords. The recommendations related to the keywords are the same one used with Google AdWords. You should make sure that you explore matching options, and you should take advantage of negative keywords in order to limit the audience for your ads and exclude queries that do not convert. You will also be able to choose the bid per keyword. You will now set up the bids for the campaign. You will also choose targeting options, in order to set who and when will be able to see your ads, as well as on which devices you want to show your ads. Advanced settings include ad distribution, pricing model, scheduling, exclusions, ad rotation and keywords matching options. These settings will help you optimize your campaign in order to maximize the results. When you start to create a campaign, there is only one button for both Search network and Content network, so you are automatically opted for both of these options. However, at this point of campaign creation process there will be an option to choose both networks or only one of them. After you have chosen the settings, you can click to save and proceed to adding payment information. Having saved your campaign, you will see the status in your Campaign tab. Conversion tracking helps you measure the success of your campaign by tracking actions people take on your website. Use different goals to track and measure conversions.You should choose the goal type and provide value for that goal. For example, if you choose to track page views per one visit, you can add 3 pages to be your goal, so your goal will be achieved each time at least 3 pages of your website are opened per one visit. 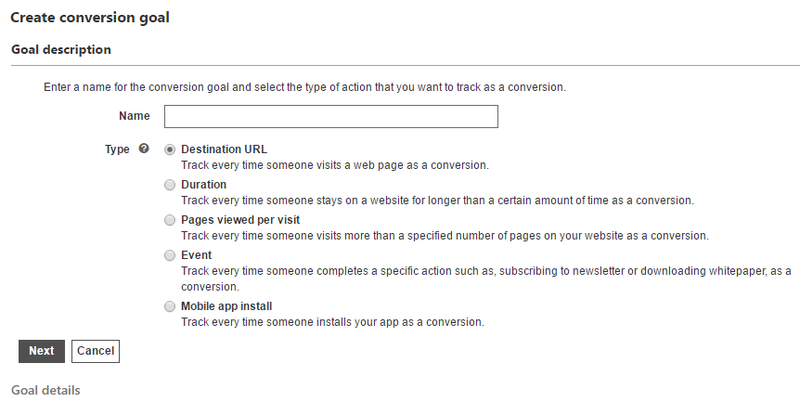 This way you can also track specific URLs, duration of the visit, choose custom events or track mobile app installs.